RPG Character Library: Dungeon ADVENTURE! 2! Quite a while ago, I began participating in an experiment during a very dry period in my creative life. The experiment was as follows: Go through the RPGs you own and make characters for each one. This proved to be an interesting process, as it got me to painstakingly go through many of the systems that I owned. Making some of these characters revealed hidden gems, while others made me want to set things on fire. Because I am only an infrequent blogger at best (partly because "easily distracted" partly because "the writing style of my blog posts makes it seem like I have neurological processing issues") the grand majority of this blog is taken up with character portraits for games I will likely never run or play. Early on in the process, I made characters for my trunked (to use an author term) game, Dungeon ADVENTURE! Inspired by Joe, of Monkeyden Games, I made a character with the earliest version of the rules I could find, and the same (or similar) character made using the latest iteration of the rules to that date. You can re-read the thrilling saga here. Looking over the many, many iterations of rules for Dungeon ADVENTURE!, in preparation for making that post, caused a long dormant machine in the back of my brain to come chugging back to life. I realized that I had lost sight of the original appeal of the game--that being that it was streamlined, straightforward, and easy to make characters for. I also realized that there was nothing stopping me from going back through all the different versions of the rules, picking out the bits that actually worked, and cobbling them together into a new, better version of the game. Earlier this year, I had Joe Blomquist design me a nice cover (featuring art by John Forish and Josh McGaw), formatted my Word document, inserted a bunch of appropriate clip art images, and published the current version of Dungeon ADVENTURE! thanks to the fine folks (and machines) at Lulu. Shortly thereafter, I was inspired to write more for the game, first a module, then a setting guide. If I can keep up this pace, I will have quite the line of products soon. I'll probably be talking a lot more about the ins and outs of the Dungeon ADVENTURE! game, as well as details of its rapidly growing campaign world, in future updates. For right now, I though I'd circle back around to the beginning and make a character using the current version of the game. The game has six stats, most of which should be familiar to people experienced with role-playing games. The stats, as well as what they do, are as follows. Strength: How strong you are. Determines the types of armor and weapons you can use. Agility: How dexterous you are. Determines the types of weapons you can use. Mind: How smart you are. Important for wielding the eldritch powers of Sorcery. Combat: How well you attack and evade in combat. Dump stat for the thinky characters. Charisma: How likable you are and how commanding your presence is. Health: How hardy you are. Double this stat to determine your Life Points (HP). All stats are determined by a random roll of 2d6. Roll six times and place the results where you want them. I get the following results: 4, 7, 3, 8, 3, 10. Sub-par, but I feel like I can work with them. I also wonder if maybe there ought to be a new rule where players can roll 3d6 for each stat and drop the lowest. No, no, Geoff. The game is already published. Move along, move along. Next up, I have to determine my character's Kindred and his Class. I have decided to make this character as similar as I can to the characters that I made with the earlier versions of Dungeon ADVENTURE!, so, to that end, I decide that my character is a human sorcerer. Each Kindred species gets bonuses to two stats and bonuses to three skills. Humans, being the most diverse, get +1 Combat, +1 to another stat, and +1 in any three skills of their choice. I put the other stat bonus in my Mind, because the Mind stat is of paramount importance to a sorcerer. Each Class starts with some benefits, a +1 bonus to three skills, and a special ability at first level. As characters rise in level, they will gain access to additional abilities. My character gains a scene spell slot (I'll explain this in a minute), access to a school of Sorcery, and gains +1 Life Point at 3rd level and every other level thereafter. He also gets +1 to the Resist Magic, Lore (Any One), and Sorcery (Any One) skills. A sorcerer's first level ability is the gift of The Sight, which allows me to detect magic on people and objects if I make a successful Mind roll. The next thing I must do is pick skills. I start out with the skills provided by my Kindred and Class, and also get 5 skill points to buy skills. Skills have multiple ranks, and each rank in a skill costs one skill point. I could dump all five of my points into one skill, split them evenly between five skills, or spend them however I want. Certain skills have (Any One) listed in their description, which means I have to specialize, so I also do that now. I decide that my character can cast Aquamancy spells, and that he knows the lore of Sorcery itself. We're moving right along! The last thing I have to do before character creation is complete is buy equipment. I get (2d6+6)x10 gold to buy my starting equipment. I roll and get 120 gold, which is a nice cache of coin. I note that my character is agile but weak, which limits his weapon choices severely. I also note that heavy armor will not only impede my ability to pass Agility rolls, but it will also hamper my spell casting ability. I decide to go with the lightest possible armor, affording me nominal protection, a buckler, a sling, and a bit of basic equipment, which leaves me with 56 gold. The game has no spell lists. You are allowed to do just about anything--a) that you like b) within reason--with any of the spell schools you know. My character knows Aquamancy, so he can perform just about any sort of magic that he wants, so long as it involves water or ice. He has a few limits to his powers, however. He can't do damage/restore Life Points with any spell more than 1d6 + half his skill rank. He also cannot buff or debuff stats, skills, or armor any more than half his skill rank. For my character, that means he gets 1d6+2 and + or -2 respectively. He also has to determine the range of the spell when he casts it. He can target himself or one other person within 50' x his rank (200') at no penalty. He can attempt to cast a spell with a 10' radius AOE centered on himself at a -2 to his casting roll, or he may cast a ranged spell that has a 10' radius of effect at a -4 to his casting roll. Lastly, and most importantly, he is limited to the number of spells that he can cast at a time. Spells have two duration in Dungeon ADVENTURE! : Instantaneous and Scene. Instantaneous spells take effect and then dissipate, having accomplished their effect. Scene spells remain in effect for the duration of the scene (or if the target breaks line of sight with the caster, goes out of the caster's range, or if the caster is rendered unconscious). My character has one scene spell slot, which means that he can have one Scene spell active at a time, though he can also cast one Instantaneous spell each round. If he tries to cast a new Scene spell, the first one immediately stops working. Worry not, though, because my character will gain additional scene spell slots as he rises in level. With all that being said, here's my character, ready for adventures in dungeons, or elsewhere! Okay, now that that's out of the way, I got an email from Dave that had more art in it. Specifically, the art of the sample ship, which is referenced quite frequently throughout the text of Boldly Go. That's right, I'm talking about the dauntless ship that is currently crewed by our dauntless sample characters. Put your hands/hand analogues together and give a warm welcome to the SFS Oswego! I have to say, I'm really happy with how this turned out, especially since I gave Dave virtually no guidance at all beyond, "yeah, so I want something iconic-looking that's not so iconic that people, and large entertainment conglomerates, can sue me for it." He sent me a half-dozen drawings or so and this is the one that I liked the best. I really do love that giant viewing window in the center! As is right and proper for a game set in this particular genre, the Oswego is every bit as much of a character as the ones who crew her. Part of this has to do with the fact that, during character creation, players get to assign a traits to their new ship. As with character traits, ship traits can be pretty much anything the players can imagine. In many cases, players try to make a "well-balanced" ship with traits that cover a wide variety of possible adventure scenarios. In other cases, however, I've had players make experimental ships, abandoned alien ships that they've found and barely know how to drive, medical ships, science ships, and the ever-popular, 'bristling with weaponry and heavy shielding' ships. That last sub-category of ship probably doesn't have the giant viewing window. I'd imagine they replace the window with more guns. Since the Oswego is a character, I thought I'd run through its traits. Keep in mind that this ship was designed organically by one of my long-suffering teams of playtesters, so it is, for all intents and purposes, a "real" ship made by "real" people. The Oswego, and ships like it, can be yours for the low price of zero galactic credits, because we don't use money in the future, for some reason! I play Enoch, a gravedigger, at the Mystwood LARP. Mystwood takes place at two sites: The Keep, in Jefferson, ME, and Burgundar, in Harrison, ME. Lately, in Burgundar, the town has been beset by a vile Chaos demon named Old Grom. As Grom is wonderfully played, delightfully scene-chewy, and possessed of a somewhat generic appearance (an old man in a black cloak and an eyepatch), he has started to get blamed for things he hasn't even done. This amused me so much that I wrote a song about it. Here it is. NOTE: I am not a musician or a poet. I don't know the tune to this song, or if one could even be crafted for it. I doubt that it will scan. Please be gentle. Also, this will likely make sense only to about 40 people, but I hope the conceit is amusing enough that people conversant with the fantasy genre will also enjoy it. As a constant reminder, the art in this post (and all other Boldly Go posts) is provided by the amazing Dave Woodward of Badgerlord Studios. He's not single, ladies, but he does do commissions! 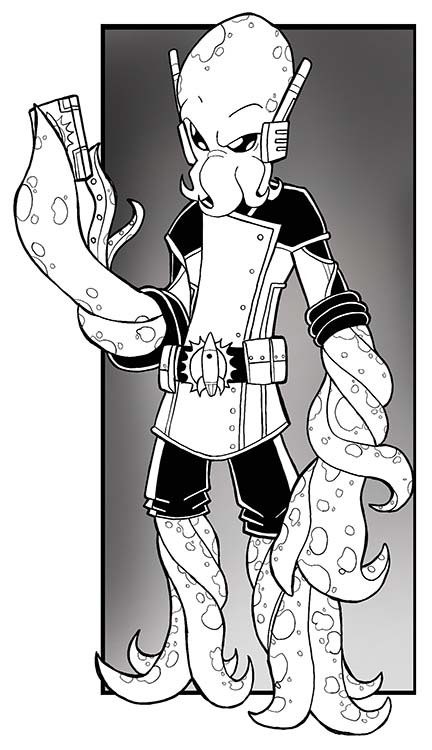 Character number seven is a personal favorite of mine, and is none other than Helmsman Grummox Benthos. Grummox first came to life many years a go in a funny sci-fi novel I was writing. I may try to finish that novel someday, especially since I've learned quite a lot about writing between then and now. I'm not sure if I'd keep Grummox in that story or if I'd change him a bit...It might be too confusing. Then again, it might give the fans (he says, somewhat hopefully) something to argue about for the rest of time. Oh, right. Grummox! He's a krakenoid, a species of squid people that originated on the oceanic planet of Yurgos. The krakenoids have a culture based around their military, and hierarchy and proper protocol. Grummox is an exemplar of his species, and is even more fussy and hidebound than the usual krakenoid. As described by someone who played him at a playtest, he's, "kind of a cross between Worf and Sam the Eagle." Character number eight is Ensign Vexxa Smith-Merienas. She's best friends with Janine Tarian and a member of the Oswego's security team. Vexxa is also the game's example of a Mixed-Species character; in her case, she is half human and half krakenoid. Mixed-species characters are able to mix and match benefits from both of their parent species, but also gain the I Don't Fit In trait. 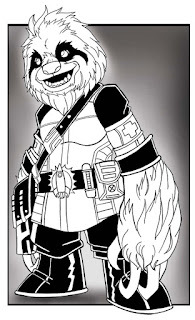 Many characters who are mixed-species join Space Fleet in order to "find themselves" and find a greater purpose. Vexxa is more than a bit like that. She grew up in the Terran Embassy on Yurgos, all but unaware of the finer points of krakenoid culture. She has always felt different and like an outsider, even on her own planet, and for that reason she is often hesitant and unsure of herself. She does, however, possess a natural empathy which makes her an asset to any security detail she is assigned to. She's often teamed with Janine, and acts as the "good cop" to Janine's "bad cop." Four crewmembers down. Five to go. Let's talk about two more of them here, shall we? For those of you who forgot, all of the art in Boldly Go! is being drawn and inked by the fabulous Dave Woodward of Badgerlord Studios. I am sure that Dave would be happy to take your money and draw for you, so drop him a message or something if you are so inclined. Character number five is none other than Dr. Phinnea Del*Prinnus, the Oswego's Chief Medical Officer. She is a rittian, which are a species of sapient sloth people native to Rittia I. Like most of her kindred on Rittia, she is extremely laid back, eerily calm, and seems never to be phased by the strange phenomena the crew encounters every week. Under her care, the crew of the Oswego has never been healthier, whether physically or mentally. In her spare time, she hangs around on the cargo netting strung from the roof of her quarters, or on various bits of piping or ductwork that run throughout the ship. She has a good working relationship with Omolara Namuyangu, the Oswego's Chief Science Officer. We cross the hall from Medical to Engineering and encounter crewmember number six, Vistabo Roseus. His name means something in Latin, and that something is a joke that is marginally funny to, like, six people or so. Vistabo is a gattoan from the savage, desert world of Gomeisa (which orbits Beta Canis Minoris--another terrible joke for those of you playing from home). Vistabo's species is based on our very own sand cat (seriously, check them out, they're super cute). 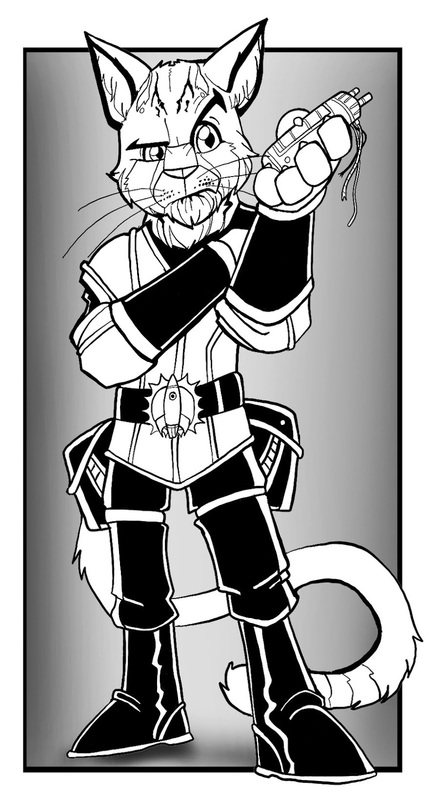 Like other members of his species, Vistabo possesses keen reflexes, cat-like grace, and a somewhat territorial disposition. Do not touch his console, or you risk pulling back a stump. Vistabo has personally saved the ship on numerous occasions, which has won him the respect of the crew and a certain amount of forgiveness for his personality. In addition to his territorial nature, Vistabo can be rather brutally honest, and sometimes this can border on offensive. Despite this, he has become rather close friends with Mott'trog, sharing a love of big band music and all things technical. At least, I think it's 3rd Edition. I decided to jump from the earliest edition of this game (Metamorphosis Alpha) to the most recent version of the game that I own (and also, the only other version of the game that I own), to see what had changed and what had remained the same. The short-short version is: The rules are better. It feels like it's a much better thought out game and game world. A lot of the early ideas (mutants, etc. ), have been updated and expanded to differentiate them and make them more interesting. There's still a bizarre preoccupation with future tech, for reasons I can't quite explain. The game is set on an irradiated, post-apocalyptic earth instead of on a space ship, which helps to explain all the wilderness and the stable populations of various mutant beasties. Once again, I went in without any idea of what I was going to make, other than that I wanted to make some kind of mutant creature, because that's way more fun than playing a straight human. The game starts me off with the Mutated Animal template. I get some Physical and some Mental Mutations. +2 Stealth, -6 to Robot Recognition (robots once served human masters, and I am not human), and I get some abilities from the animal stock, which I must choose. Amused that it's an option, and reminded of a certain character I played at a LARP once, I choose Weasel. Weasel gives me a Physical Strength (PS) 9, Dexterity (DX) 12, and Constitution (CN) 5. I can also bite for 1d6 damage, get Night Vision (per the mutation), and have a Base Speed of 14 (9 if I walk just on my hind legs). I now get to do adjustments. To start with, I look exactly like a weasel, except I’m smart. If I was under a meter in height, I’m now a meter in height. I cannot talk or use tools, however, various mutations can remedy this. If I don’t take any mutations to make me more human, I get +1 Physical Mutation, but have -8 Robot Recognition. I get all of the stats listed above, plus a 2d4 roll. There are also other attributes for which I must roll. Different species (Mutant Plant, Mutant Animal, Human) all have different ways of rolling for their listed attributes. For every other attribute but Senses and Mutation Power, I roll 3d6 (like you do). The other two are calculated by 4d6 drop the lowest. Thank you, TSR. I should also point out that Mutation Power seems to need to be rolled for each power that requires it (it's basically a casting roll). At least, I think it does. The rules are quite extensive, but I was skimming. Now I roll for my mutant powers (1d6, consult chart). I will always get five mutations, but the roll tells me how they split. In my case, I get three Physical and two Mental. I now roll percentile dice and consult the appropriate charts. Unlike Metamorphosis Alpha, there's a wide variety of powers that are all very well described and defined. In addition, the GM doesn't get the ability to hobble me with a randomly awful power. There are still powers that are defects (marked with a D), but I'm not guaranteed to have one (or any), and if I roll them, it's my fault. In addition, I can only have one physical and one mental defect maximum, so I won't wind up playing a character whose mutant abilities only weaken them. Now, the mutant powers that turn my animal from a mutant animal into an uplifted, bipedal animal are not listed in this section. They are listed in the animal section, however, and they are Talk, Bipedal, and Manipulate Tools and Objects. I spend all three of my Physical Mutation points to buy these. I am now a chatty, humanoid weasel. Yes. And now I determine my mental mutations. 99: Roll 2 mental mutations. Okay! 95: Pick any one mental mutation of your choice. I was bound to roll well sooner or later! This is funny, because the character that I played, who was nicknamed "Weasel," was a super-smart necromancer. So I decide to go whole hog (full weasel?) and name the character "Callen." Death Field Generation allows me to damage the life force of all living things around me. The field isn't as game-breaking as one might thing it is, because it also targets me. I can also only use it once per week. Heightened Mental Attribute randomly affects one of my three mental stats (Mental Strength, Intelligence, or Charisma). I add a number of points equal to 6 - the attribute's modifier. This is nice, because it's guaranteed to give low attributes a nice bump. I roll 1d3 and get 3. My Charisma gets improved. It's modifier is +6, so I raise it to 18. Hello, cutie! Telekinetic Hand is the power I took for my selected power. It doesn't have the oomph of true Telekinesis, but it allows me to make fine motor manipulation as if I was using my hand. Now I get to pick my character class. There are four: Enforcer (Fighter), Esper (Magic User), Examiner (Good with Tools), Scout (Rogue). I decide to go with Examiner, because it's the different one, and because the character that this character is loosely based on was interested in ancient history and magical artifacts. My class gives me a whole pile of things, including one randomly rolled Tech IV item (I get a parachute), +1 Robot Recognition, +1 Use Artifacts per level, 16 points to distribute between four skills: Avoid Artifact Disaster, Jury-Rig, Read Schematics, and Repair Artifact. Since I have 16 points and 4 skills, I make them 4 each. Mostly because I don't know what's better. All classes have several common skills, with percentages based on the class itself. These are Read, Write, Ride, and Swim. Examiners have Read 100%, Write 100%, Ride 25%, and Swim 10%. After that, I get my derived attributes. They are also called skills and everyone gets them. I will say that this rulebook is laid out in kind of a strange way. For instance, my derived attributes are based on my primary attributes, but are listed after classes, not with the attributes themselves. But what do I know? I'm not a game designer. The derived attributes are a big, long list, and it sort of clunks up a game whose design I felt was running pretty smoothly thus far. I won't copy the list here, but you can see it at the end, with the character. I will note that they kept CN as hit dice, just like it was in Metamorphosis Alpha, which is something I rather liked. I now have the option of joining a Cryptic Alliance. I take a read through them and they are all silly. Like, okay, not silly-silly like Paranoia, but not too many steps removed from that. I find that I can't take any of them seriously and, so, I don't join any. Besides, I'm playing a charismatic loner. I don't need no allies! Now we get to the Equipment section and, to my mind, the most baffling part of the game. The world is listed as being Tech III generally, which makes it Renaissance-times, according to the book. This would be fine, except things like laser pistols and micromissiles are listed under Common Equipment. It's fine, because I can't afford them anyway, but it seems like a very strange design choice. I would almost prefer it be split up like D&D, with regular equipment being more primitive and fancy future stuff being the "magic items." The section also says that the GM gets to decide how much money and equipment I get based on where the game starts. Then it says, "oh, just kidding. Give them 250 + 1d10 x 10 donars." I roll a 1. So I get 260 donars. I purchase some basic weapons and armor and decide to call it a day.